Here's a link to the photos in the online archive, which include a function for zooming in. The images are relatively high resolution, so you can see a lot of things when zoomed in. + We've seen renderings with cars on the ESP before, so that wasn't surprising. But we did take note of the way the renderings appear to make the ESP more connected to the surrounding area. Sure, there's still a fortress quality about the plaza, but there are also elements like the long pedestrian ramp leading people down to the base of the huge wall on the east side of the plaza. 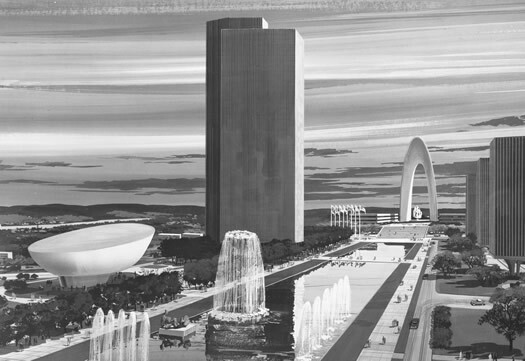 + The designs very much evoke Brasilia, even more so than the designs that were built. One more: This rendering doesn't have the museum arc (or whatever it would be called) -- it has something more along the lines of the actual State Museum -- but we thought it was worth a look. What they don't show is the 9000 people that were displaced by this development. However, that story will soon be told. Little known fact: the original name for the ESP was "How To Serve Man." 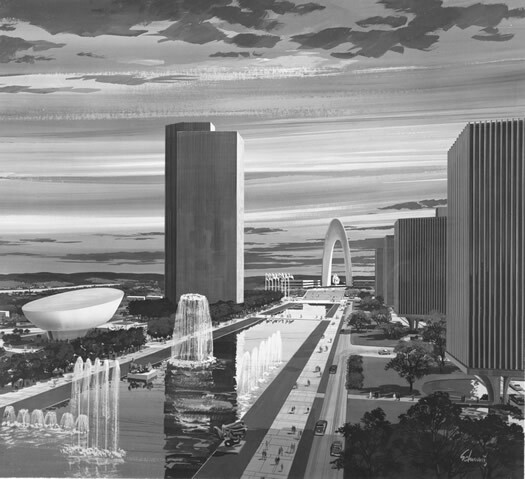 Renderings provide a much better balance and aesthetic than what currently exists. A shame it was not implemented as such. There's still time to add those towering fountains! They should have gone with the arch. 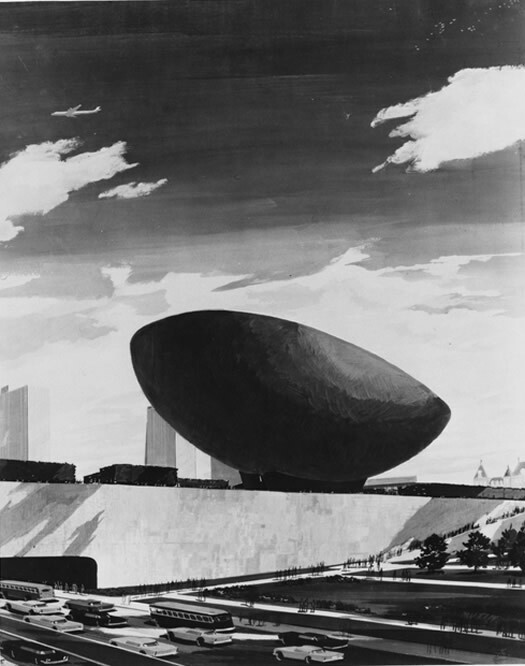 Its curved lines would have tied together with those of the "Egg," which has really always been questionable on its own, surrounded by all angular structures. Did some layman think he "knew better" than the architects? These are fabulous. Thank you for sharing. 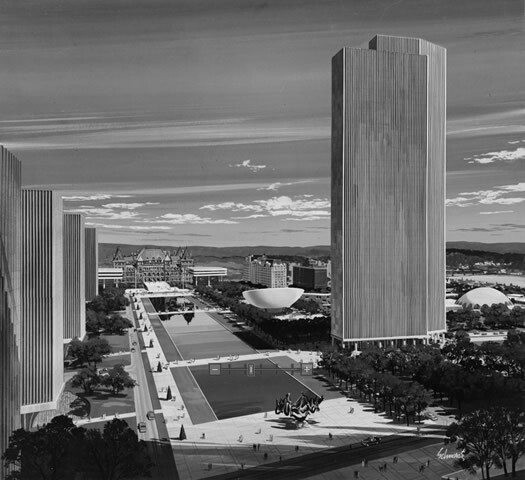 While certainly preservationists today would fight hard to keep the neighborhood lost when the plaza was built, Albany did end up with a remarkable piece of civic architecture. So much mediocrity, or nothing, was built on the ruins of neighborhoods across the country during urban renewal. 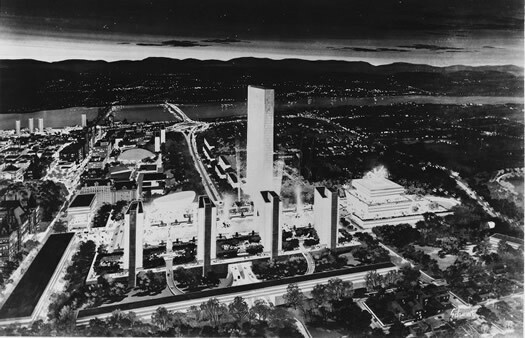 I'm thankful that Governor Rockefeller at least had a vision, or the intelligence to hire good architects. The arch was replaced by the Cultural Ed Center because NYS librarians and curators complained. The design above did not provide enough space for books, exhibits, and school trips. Architect Wallace K. Harrison later griped about the design change in his Columbia U oral history.